Where I make mead; pear and rosemary mead; and quince and spice mead. Mead is a magical elixir made from honey. Among other things, it's know as the drink of the gods. It's said to have the power to grant you insight into the unseen realm - which is surely true if you consume enough of any alcoholic drink. Then again, the bees are said to travel between this world and the next, as messengers to the gods and the dead. That's one of the reasons why the mythology of bees says we must tell the hive the household news each day. Imbibing a drink made from the nectar of such supernatural messengers must grant some special powers, if only temporary. I have read about mead from time to time, in poetry and literature, but always believed it was far too complex for me to try making. Until recently, none of the local shops carried it, or if they did, it was beyond my price range. But recently, I've grown more enamoured with the idea of mead. I have found numerous mentions of mead through my research into medieval and iron age cooking. Giving my new found courage (and decent level of success) with fermenting and increasing desire to keep bees, I have decided it is time to try mead. I first tried some mead at a medieval event, it was berry mead and to my taste, it was very sweet. But good, and surprisingly strong alcohol content. But still a bit yeasty (I get flushed from yeast) so I imagine it would have been even better with another racking and 6 months more ageing. Then I discovered some mead in a liquor store. Two brands from Vancouver Island, actually - although it was all fruit and berry mead, with only one bottle of spiced mead, which was as close as I could get to unflavoured. So I brought a bottle of spiced mead home and have an oz of it every now and again. It helps settle my stomach if it's still upset at bedtime - an added benefit. Deciding that yes, I like mead, it is now time to make some of my own. Following the instructions from Wild Fermentation and The Art of Fermentation, I combined 1 part raw honey with 4 parts room temperature water, mixed very well and left in a wide mouth container, stirring at least three times a day, for about a week until it looks like there is yeast active (small bubbles, froth, taste and smell). Then it goes in a jug with an air lock to bubble away. Once it's finished bubbling, I'll taste it and rack it (move it into a different jug with an airlock to aerate the mead and re-activate the yeast). I don't know how long I'm going to age the mead before bottling, there are some meads that age for years before bottling, others are drunk in a matter of weeks. I think it will depend on what else is going on in my life and how it tastes to determine when I'm ready to bottle it. For these first few stages, I have it upstairs at room temperature, but once I rack it, I think it will go downstairs where it is cooler. The first batch looked good, so why not try some more? I had a hand full of pears that missed being made into Parry this year, so I thought why not pear and rosemary? It's a good pairing - ha ha - as I've used this combination as a sauce for pork. The quince tree only had two quinces. Quite frankly, I can't seem to like quince very much, it's kind of coy tasting and very strong smelling. But I don't want to waste them, so I decided to try for a Quince Poudre Douce tasting mead. Quince, pepper, ginger, cinnamon stick, and some anise (because they look so pretty). To make flavoured mead, at least according to Sandor Katz, is to slice up your fruit very fine and add them to the mead during the open vessel stage. Proceed as per normal mead, and strain when you put it in the jug. The fruit has natural yeast on it, so it will usually start to ferment faster than honey on it's own. However, certain processing and herbicides in commercial fruit may have adverse effects if you are capturing wild yeast like I did, so please use organic or home grown fruit. For the fruit mead, I used less honey as the fruit already has plenty of sugar. I did 1 part honey for 5 parts water. These are just small batches one gallon, or in the case of the first mead, half a gallon. These tastes combinations may be completely horrid! But from what I've read, if the mead tastes terrible, leave it for six months to four years, and it could improve... or else, you may have killed the offending taste buds in the interim. This process is simple, albeit fruit fly generating. I can't believe I ever imagined it would be difficult. It is a nice way to use up small amounts of fruit, berries, and other goodies laying around. I'm looking forward to finding out how these little experiments taste in a few months time. I think that making mead at home is an affordable way to make a nice sipping alcoholic drink. Considering it costs about $25 for a 750ml bottle at the local liquor store, as opposed to the $12 starting price for a drinkable plonk (wine), you don't need much honey to make a bottle of mead. About 1/2 to 2/3rds of a cup aught to do it, which is about $1.30 per homebrew bottle of mead. Would be less if you make mead from gleaned fruit and use less honey per water ratio. Although making mead doesn't take much active time, it does require a lot of waiting, I'm told, to make a good mead. So perhaps it is worth the extra twenty three dollars not having to take up space and carboy waiting for the mead to age. Honey has many health benefits and mead also has a long tradition of healing qualities. I only know some of the cultural mythologies that surround this elixir, but I suspect there are some scientific studies out there for those who care to look. Of course, like all alcoholic drinks, moderation is key. A little everyday is said to help your health, however, too much... well, you've all seen the government warnings I'm sure. Allergies: Homebrewing something like mead is nice because you can avoid a lot of allergies like sulphites (or was that sulphates? ), extra ingredients, and can brew it long enough so that all the yeast is exhausted. Keep in mind, some people have negative reactions to honey and alcohol. Now my Viili has well and truly curdled. It no longer smells like yoghurt and is starting to sour. When I touch it with my finger, a long gooey strand comes away with it, but for the most part, it's just like curdled cream - still pourable, not set at all. The taste is like sour milk with a strong chalky aftertaste. Not nice at all. I read in The Art of Fermentation, and the people of Wells of Health confirmed, that when the yoghurt curdles it means that it has cultured too long. The advice Wells of Health people gave is to put it in the fridge (keeping the cotton ball in the culture) for 6 hours, then remove the ball and take a bit of the thickest part of the curdled yoghurt and use that to culture a new batch. I thought that maybe there was something wrong with the milk I chose for the first batch, so I went to the shop in order to buy some organic whole milk. But when I was there, they had something called cereal cream on sale (it expires in a few days, thus the sale). It's organic, and what's more it comes in this fantastic glass bottle! I had a taste, and it's yummy stuff. Not certain how this cereal cream is made, but it's one of the few cows milk products I've tried that doesn't upset my stomach. It's strange that only organic cows milk (and not all of it) sits well with me. This leads me to wonder if it's something in the diet or medication they give the cattle that I'm reacting to, and not the milk itself. These days I also react badly to beef, most beef, but not all of it... something to wonder about anyway. I have two cups of cereal cream left, so I will have to find something else to make with this today. I wonder if I can make butter from it? However, if it works as yoghurt, I may not have any of it left to experiment with. a bit like a snot booger sorry to say. and there is something like way? The viili yoghurt culture is more challenging than expected. It's gotten to this clotted cream stage, and no further. I think it's stuck. Although, I must say, I really like the smell. It has all the best qualities of a yoghurt smell - sweet, enticing, smooth - without any of the aroma I don't like - sour, milky, acrid. The people at Wells of Health got back to me quickly and said, just keep waiting and whatever I do, don't put it into the fridge until it is set. It's reassuring to know that I'm doing the right thing as I'm always so nervous when I make things from milk. I can definitely see that the culture is doing something to the milk, so wait a bit and check on the culture, will be my rhythm for today. With hopefully a trip to the store to see if I can pick up some Koji and chickpeas for miso making. The Kombucha isn't changing much, maybe a bit more cloudy, like mist raising up from a valley at dawn. No daughter (or new mother) is forming yet, but I think the house may be a bit cool for it. The Kombucha tea getting quite beautiful in the jar, but difficult to photograph because of the reflection in the glass. I bet there is some sort of trick for getting around that, one day I'll learn it. ...steamed up camera lense! Photographing hot food is harder than you think. Here's a random thought: If this yoghurt cultures at room temperature, is it a chance this will be more bento friendly than regular store bought yoghurt? If I pack it in my lunch will it stay yummy longer at room temp than the store bought stuff? After 48 hours, the Viili culture is still culturing. It looks a bit like heavy cream, but certainly not "thick and viscous, almost jelly like, very “ropey”" (wells of health), which leads me to think something may not be working yet. As you can see, there is a change going on, just not enough of it. Re-reading the instructions I've noticed that I'm keeping it at the lower temperature range (round about 70F) so I increased the room temp to about 77F to see if that will make a difference. I also banned off an email to the Wells of Health people. They have a really nice return policy that says if the culture isn't viable (for the first culturing) then they will replace it, but first drop them a line and they will help troubleshoot. Apparently, "...99% of the time we are able to help with a successful batch, if the cultures are still on hand." In other words, don't toss it out if it doesn't look like it's broken, as they won't replace it. The instructions also say it can take longer than 48 hours to make yoghurt from a dry culture, so I'm not terribly concerned yet. I just wish I had cultured it in a dark coloured jar so that it would show up better in the photograph. As for the kombucha, it's kombuchaing away. Little wisps of light coloured 'smoke' are rising from the mother (which is now sunk to the bottom). There is no sign of a baby SCOBY yet, but I have faith it will grow in it's own time. A spread for visitors, including fresh dates, grapes, cherries, peas from the garden, collection of crackers (gluten free and regular), cheese and dips. Looks impressive, but the best part is that it is easy to prepare a head of time and just plate the cheese, dips and crackers when it's time to dig in. 22 hours after I started my Kombucha and Viili cultures, it's time to check in and see how things are growing. The Viili yoghurt is starting to thicken as you can see when I slightly tip the bowl. However, it's still too runny, so it will go back to sitting on my dresser - I have it in my bedroom because the kitchen is busy today and I don't want to get jostled and spilt. It's also easier to avoid temperature fluctuations in a smaller room. The instructions said it will take between 24 to 48 hours (possibly longer) to set, so I'm going to check it every 2 hours or so from now on. But I suspect it has a long way left to go. The Kombucha is not doing much yet. Hopefully you can make out the mother in the photo. It's the lighter coloured blob in the jar, at an almost vertical angle. There are a few whips of light coloured tentacle like objects expanding upward off the Kombucha mother. If I read correctly, this is a good thing as it means the mother is making a daughter. The colour of the tea has darkened, and the fruit flies are frustrated that they cannot get past the cloth protecting the tea. Just a faint tea like smell, barely registers. My Kombucha and Viili cultures arrived Wells of Health today. I'm very excited about this, as I've never had Kombucha before, and I've always wanted to make my own yoghurt. As these are live cultures, they need to be fed right away, so I got to work. First thing I did was re-read the rather indepth instructions. After you place your order, they send an email with the instructions, which is awesome. Especially when you consider that this Viili yoghurt isn't like other yoghurts, you don't heat it. I repeat, you Do Not Heat the Viili! A yoghurt that you can cultivate at room temperature - those people in Finland are very clever. Next I brewed my sweet tea. Just waiting for the kettle to boil. I choose some loose leaf tea (without any oils as apparently they are bad for Kombucha). Once I was happy with the tea I left it to cool for a few hours until it was room temperature. What is Kombucha anyway? Kombucha is a fermented beverage made from tea, sugar and a SCOBY called a Kombucha Mother or sometimes called Kombucha Mushroom. It is not a mushroom. The SCOBY is a colony of yeast and bacteria that feed off tea and sugar. Somehow they have this symbiotic relationship that helps them live together and make (what I'm told is) a yummy drink. Kombucha also has many health claims associated with it, but I can't for the life of me remember what they are. Probably something about detoxifying, that's always popular. While I wait for the tea to cool, I take out the Viili. Because it had to travel across the border, which could mean delays, they shipped me a dry culture. Basically they dipped a cotton ball in their culture and dried it. Once it's dry, the culture goes dormant for a few months and can be woken up with some milk. It doesn't' have any noticeable smell, and the texture is kind of crunchy. But that's enough playing around, it's time to wake this culture up. The first batch of Viili I make will be small, just half a cup, but then I can use it to make more in a few days. It's a self feeding cycle, where I take a few table spoons from the last batch to start the new batch. Viili is a fermented milk yogurt from Finland. It is thick and viscous, almost jelly like, very “ropey”. It is mildly sweet and pleasant tasting. Viili thrives on cream. Make it with half and half for a rich dessert. Eat it plain, served with fruit and berries, or sweetened with honey, sugar, or Stevia powder. That sounds delicious. But then I read in The Art of Fermentation that the texture can be quite challenging to the North American pallet. From the description I'm not certain if Viili is going to be like yoghurt as we know it. But I don't know any better words to describe this kind of cultured milk in English, so yoghurt it is. But that's not the exciting bit. The really exciting thing about Viili is that it doesn't require heat to cultivate. Most yoghurts need to be kept at a specific temperature for a few hours, which isn't all that easy. Viili grows at room temperature. I don't need to waste time with special equipment and fussing over temperature. Viili should be ready for the next step in a day or two. By now I'm sufficiently distracted by making yoghurt and some visitors, my tea is cold. Time to put the Kombucha together. The Kombucha mother comes with enough liquid to make 1 quart of tea. I can make more next time by saving more liquid. The SCOBY smells sweet and a bit like the forest floor after rain, so I can see why people call it a mushroom. Following the instructions carefully I put the kombucha in it's new home. It should be ready for me to try in about 5 days. Can hardly wait! So far, I like the Wells of Health shop. The shipping was quick and the instructions on how to grow the cultures clear. The packaging was fantastic, maybe a bit excessive, but I'm glad they did go the extra mile...um extra bag, because you never know what kind of adventures your parcel gets up to in the post. Affordable cooking? I think this is going to be great. Milk is far more affordable than live-culture yoghurt and I'm told that Kombucha in the store is pricy. They are both self perpetuating cultures, meaning that you make the next batch from a bit of the last batch. In other words, once you have a culture, you don't need to keep buying more. I'm also thrilled with how healthy this will be to have my very own live culture yoghurt on demand. Who would have thought Ginger Burdock Beer could be so dangerous? Like any home brew carbonated drinks, it can be explode with deadly force. Homebrew sodas like this are made with yeast. The yeast eats up the sugar and turns it into gas (and alcohol, but not much alcohol in this case, usually less than 1%). When the soda is brewing in it's large container, it only has a cloth over it, which allows the gas to escape. That's also why we use airlocks when brewing wine and Cider, so that the gas produced by the yeast can escape. If we just put a lid on it, then the gas would build up and build up and over time the pressure will be too much for the bottle to contain... KaBoom! We want some of this gas when we make ginger beer, or sparkling apple cider, or any brewed bubbly drinks, so we place the drink in a high pressure container before the yeast has finished eating up all the sugar. That way we get a satisfying fizz sound when we open the bottle and a light tickle of bubbles as it travels down the gob. But sometimes there is too much sugar (as in the case of the very sweet burdock root) or it's kept in too warm a place, and even though we use strong bottles, it can explode...usually in the middle of the night. That's why many people like to use plastic bottles, so that they can feel how much pressure is in the bottle. Even though I used half as much sugar for this ginger-burdock beer than I use for ginger beer, it carbonated much faster than usual. I suspect that there are two main kinds of sugar that the yeast eats: fast sugar and slow sugar. I think that the white sugar is a fast sugar, as the yeast uses it up in a few hours/days. But the burdock seems to have slow sugar, that the yeast eats slowly... but not slow enough. All but one bottle exploded last night, lucky for us no one was near by, but it was so strong that it exploded through the box and packing that we used to keep it safe. So we thought we would have some fun and see what would happen when we opened it. Far too dangerous to leave laying around the house, lucky for me, I have an experienced opener of highly carbonated bottles visiting. This is my first attempted at taking and uploading a video, so please forgive the ...whatever I did wrong. Ginger Burdock Beer recipe - Brew your Gobob Ginger beer at home. Warning: This Ginger Burdock Beer does get very fizzy! I just spent the night cleaning up exploding bottles (which were exploding while I was cleaning up the mess from the earlier explosions). On top of following normal safety procedure, if you are not going to drink these up quickly, add less sugar and keep them in a closed box to limit the amount of shrapnel. Here's a delicious experiment I did the other day, Ginger-Burdock beer. It's a fizzy drink, brewed with wild yeast captured from the air. It's a lot like ginger beer, but with a deep earthy undertone to it. At first it tastes strange, sweet, but not sweet like sugar is, but also tangy. It grows on you, and after the first sip, I found myself wanting more and more. Burdock, also known as Gobo, is a vigorous weed in these parts. It has these nasty seeds, that hitchhike by attaching themselves to clothing or hair or wool of any animal (people included) who happen to come just a little too close to it. Though most people here consider it a nuisance, it has a long history of use in Europe and Asia. Just like making a ginger beer, you need a bug to capture the yeast from the air. You can use a simple ginger bug, or what I find works better is a burdock bug. Fill a jar half full with water (if you are on city water, use water that has been boiled and cooled to room temperature). And 2 tsp of sugar. Stir vigorously and cover with a cheesecloth. Twice a day, add 2 tsp of sugar and give it a vigorous stir. It's ready when it starts to have bubbles, or sometimes froth on top. If it's not active in 4 days, add another 2 tbs of burdock root. Chop the burdock and ginger and put in a large pot with the water. If you are making a huge batch, then only use half the water for this and add the rest after you've made the tea. Boil the ginger and burdock for 30 min. Cool to room temperature. Strain out the ginger, and add the sugar to the water. Add the liquid from the bug. Stir vigorously. Cover with a towel and leave at room temperature for 1 to 3 days. It should start to make small bubbles and then subside, but I don't always notice this happening, so I usually bottle when I get around to it instead of relying on the fermentation. The longer you leave it at this stage, the more alcoholic it will be. A normal ginger-burdock beer should be less than 1% alcohol. Think more soda than beer. Bottle in bottles that can handle pressure. Burdock has a lot more sugar in it than you may think, and I find it carbonates quickly and with great enthusiasm. Mine was ready for drinking 3 hours after I bottled it (opposed to the 3 or 4 days the ginger beer takes). Be careful when you open it. Best drunk outside. When I strained the ginger burdock tea, I was impressed with the fluorescent green colour of the liquid. Although it quickly oxidized into a more natural looking brown - green. The finished drink clarified quite a bit. I think that next time I make this, I may try cutting the sugar in half and see how that tastes. Affordable cooking: yes, I think so. I harvest the burdock from the garden, and ginger is affordable these days. Healthy: I think so. Both burdock and ginger have healing properties in most traditional medicines. Compared to commercially carbonated drinks, there is very little sugar in this. Also, it's excellent for replenishing electrolytes on a hot day. Kechk Dip Recipe. What is this Kechk stuff anyway? Kechk is a traditional Lebanese food made from yoghurt and wheat, that is fermented, dried, and ground into a shelf-stable powder that can be used for all sorts of different things. According to one person I talked to, it doesn't have to be made from yoghurt, his mother in Lebanon, makes it from raw goats milk. Either way, it looks like a great way to preserve excess milk and/or yoghurt. Before I set out to make Kechk, a project that takes a few weeks I'm told, I decided to try some of the commercial variety. It comes as a fairly fine off-white powder, and smells exactly like what I use to put on popcorn when I went to the movies as a child. For my first experience with Kechk, I made a dip. herbs like mint, chives, sage, thyme, &c. Fresh or dry is fine. Combine the Kechk powder with enough water to make a thick paste. Mix in a few drops of olive oil. Finely chop the herbs and add them to the mix. Let it sit for about 20 min or so before eating with crackers, vegetables, or a spoon. At first it has a grainy texture, but after it sits for a little while, it becomes smooth like hummus. Kechk isn't always easy to find in these parts, or affordable when you can find it, but it looks like fun to make. I can see myself making this in future. According to the book The Art of Fermentation, you can make a vegan version using the same method (but different ingredients), but not drying it all the way, forming the paste into small balls and store covered with olive oil. Apparently it makes a shelf stable vegan cheese substitute which is also good for flavouring and thickening soups. Improvising airlocks for my Wild Fermentation. This is the time of year when we do the most fermenting. The pears have just been picked and juiced, the grapes are plump and bursting on the vine, and there are far too many vegetables in the garden waiting to be picked, and no where to store them all. Parry (often called pear cider), wine, and fermented pickled veg are all on the menu for this year. One of the things I've learnt is most important, whether it be a batch of mead or a pot of kimchi, is to control the amount of air that the fermentation has access too. In Sandor Katz's book Wild Fermentation there are lots of options, some include covering the salted veg with a plate, weighted down with a rock till the brine comes out, others involved airlocks... some home made, some the type you find in a home brew kit. I found a whole box of those airlocks in a free pile at a yard sale this summer. One can often find brewing equipment on UsedAnywhere or Craigslist, for a decent price. However, these airlocks didn't have corks, they were just the plastic inserts - which turned out to be exactly what I needed. Because now I can use them for more than carboys and jugs, I can use them for large mouth jars as well. I got the idea from the Pickl-It site, who makes these fantastic jars for small batch fermentation. If I lived in a small house or condo, or could afford it, then I would buy a whole set of these Pickl-It jars. Their one ltr jar would be excellent for sampling new recipes, and might even be a useful idea for first try at apple cider - though the surface area of the liquid might be a bit big for that. They also have some nifty recipes and tips on their website that you can check out. a jar or bottle with it's lid. a grown up or someone who is responsible arround power tools and fire. Anyway, here is how I attach an airlock to a regular jar lid. Please note, that a lot of fermentations will degrade metal over time, so it's important not to let the fermentation touch the metal, and to dispose of the lid part after each fermentation, to prevent metal particles leaching into your food. First I wash and dry a jar and lid. I take the stem of the airlock and measure it, choose a drill bit that will make a snug hole for the airlock. In my case, 1/2 inch bit did the job. The next step is the difficult one. It's best done with a drill press and someone who knows what they are doing. The drill can easily rip the lid, especially the smaller lids, out of your hand and go to work on your flesh instead. Take appropriate safety steps when drilling the hole, go slow and steady. Once the hole is drilled, take a file and carefully remove any rough edges, being careful not to disturb the rubber seal on the inside of the jar lid. Also, use a magnet to remove any metal filings, don't blow on it or you may get metal slivers in the eye. Wash the lid and dry it well. Fit the airlock into the hole. You will probably notice that no matter how tight you press it into the hole, there will still be small gaps between the lid and the airlock. We will fix that in a moment. You don't really need to press it in that far, just far enough to sit in there stably. Push it in too far and the bottom of the airlock will be in your ferment - not desirable. A couple of mead bottles with improvized airlock lids. - more on that later. Lay out a piece of tinfoil or use a level, fire resistance surface that you don't mind getting wax on. Get your beeswax candle read and a place where you can put it down quickly and it won't topple over. I suppose you could use any unscented wax, but I feel beeswax is more natural and like to use it for food stuff better than petrol based wax. With the lid (airlock inserted) in one hand and the lit candle in the other, carefully drip a few drops of wax on the place where the airlock meets the lid (on the top of the lid, not the inside). Turn the lid a bit, dripp a few more drops of wax, repeat until all the gaps between the lid and the airlock are filled in. I did this with a few larger mouth jars for long term fermentation storage like shredded beats for borscht and swiss chard ribs after I discovered the 'float oil on top' doesn't work all that well for me. It's funny. When I imagine gingerbread, I think of a sweet, hard cake or cookie like substance, shaped as cute little people, houses, rounds, with icing and colourful candy. The thing I don't think about when people say the word gingerbread, is... bread. But that's exactly what gingerbread was in the middle ages: Ginger Bread. That's two words, not one, to indicate that literally, there is ginger, there is bread and they get combined somehow. Reading the book Pleyn Delite, by Constance Hieatt and Sharon Butler, I came across a delicious looking gingerbread recipe from the Middle Ages. This book contains all sorts of recipes from historical sources, including a lot of the recipes in the original text, and the modern day translation. What I love best about this book is that the authors actually cooked a lot of these recipes. I suspect that this is not the norm when translating historic cooking techniques into modern methods. But these two have done a really good job of it. I've tasted a few dishes cooked from the Pleyn Delite (which I say in my head as Plain Delight) and loved most of them. This gingerbread, I didn't love as much. I found it too crunchy, but I'm in the minority on this one. Everyone else has gobbled it down, making me fend them off with a fork and a cunning plan to have enough left over for the photograph. I suspect their plan was to finish it off quickly so that I would be forced to make a second batch if I wanted to take any pictures for the blog. Before I write the recipe for medieval gingerbread, I feel compelled to confess that not much is changed from the version in Pleyne Delite, except maybe the quantities of the spices and wording. It's a difficult recipe to improve on. I would change a bit of the method if given a second chance to make this - which I may just be strong armed into doing. In a large pan, bring honey to boil, remove from heat. Add the spices and stir well. Add the bread to the honey a little at a time, return to medium low heat if needed, stirring well after each handful of breadcrumbs. When the mixture is really thick and hard to stir, turn out onto a layer of parchment paper. spread it out evenly as best you can, then put another layer of parchment paper on top. Use your hands or rolling pin to smooth out the gingerbread to make it as even and as thin/thick as you like. Thinner is better in my opinion. Leave covered to cool for about an hour, cut into shapes. You want to do this today and not a few days from now, trust me. It gets more difficult as it ages. This keeps well at room temperature for several days and travels well in a bento box, just wrap with a bit of parchment paper and you are good to go. Affordable cooking? - Very much so, provided you use bread that would have gone to the chickens/garbage otherwise. Not so much if you are buying bread or bread crumbs just for this recipe. Cooking for your Vegan friends? - It can be made vegan friendly by replacing the honey with a different liquid sweetener. Cooking for Allergies - not many allergies here at first glance, but it's good to be careful about the ingredients of the bread crumbs (commercially made usually contain soy and other problems), spices (sometimes processed with oils or lecithin which can include soy). Just remember that your ingredients these days, have ingredients lists of their own. With that in mind, this is a very flexible recipe. You can choose any kind of bread, be it gluten free, yeast free, whatever you need. I had the good fortune to spend a day with Project Germani. They are a small but growing group of people who enjoy demonstrating what it was like to live in the Iron Age. Most of the members are high school students who are still getting use to the idea of cooking for a group. So they asked me to come along and help them do some cooking. Together we made oatcakes, always a yummy and popular treat. Then we had a look in the cooler which was full of an interesting, albeit eclectic, selection of foods. 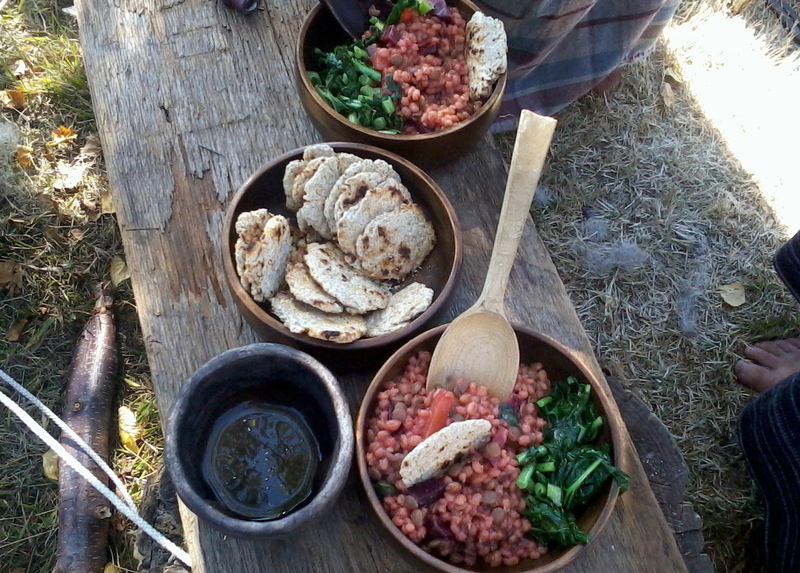 There were lentils and pot barley, but also mustard and ketchup, radishes and kale. I felt like being thrown into an episode of Chopped with no access to pantry and fridge. With no real plan, we set to work soaking the barley. Without any meat to include in the stew, we decided to toss in the lentils too. As we were feeding a bunch of teenage boys, we definitely needed the extra protein from the lentils. Protein and fat help them feel full, and the carbs from the barley help give them long term energy. Once the lentils and barley were soaked for an hour or so, we par-boiled them in a pot over the fire. Drained the water, and added chicken broth, turnips, beet, some butter, and a bit of salt. Let simmer over the fire until the root veg were tender, adding more broth as needed. Then it was time to make some greens. Got some people cutting up greens, which included the kale, and the radish tops, and an impressively large amount of parsley. Cooked it in butter, stirring frequently until wilted enough. Served it on top of the stew. Yummy! I say 'we' but really it was them that did the work. I just sort of asked questions about what they wanted, and suggested the method that would work best with the ingredients and cooking facilities. They did a fantastic job! It also turned out to be a much healthier meal than I expected from teenagers. Well done guys! It was great fun hanging out with them and learning about what life was like two thousand years ago. My favourite part was learning about the different tools, especially the knives, they used during that time. This also seems to be a time when there was a lot of interaction between cultures, which is always exciting. Not just because they traded/acquired forcefully tools and objects, but also the more subtle exchange of culinary traditions, movements of ingredients between cultures, and how it affects the cooking and agriculture practices of the different peoples. It's very different than the time I've spent in the 14th Century when the culture in Europe was far more uniform. Caudle of Almonds is a kind of medieval almond milk made with wine or ale. According to Peter Brears book, Cooking and Dining in Medieval England, it was considered especially good for people with a dodgy tummy. Cooking with and drinking almond milk was a frequent occurrence during the 14th Century. Not only was it considered a healthy milk substitute, in the middle ages there were many days in the Christian calendar that forbid the consumption of dairy products. Isn't it nice that almonds don't come from a cow? I suspect almond milk may have become more popular as the populations in cities increased during the 13th and 14th century. Suddenly you have all these people living in close quarters, with most of the dairy products being shipped in from the countryside or from cattle being raised in close quarters in town. Cows living in small yards, with no access to fresh grass, can lead to some milk borne illnesses...unhealthy cow creates inferior milk. So, if you can afford almonds, you make almond milk. Inspired heavily by Cooking and dining in Medieval England, by Peter Brears, with a few changes of my own. Poudre Forte or you could just use cinnamon and/or nutmeg mixed. Bring the wine to a boil, take off the heat and add almonds, about half a teaspoon of honey, and a generous pinch of spice. Leave to steep for an hour or so to cool. Take the almonds out (keep the liquid) and smash them good. Mortar and pestle is fine, or use the blitzer. The aim is a fine mush. Add the liquid back to the almonds and pound or mash again - this is the tricky part for me. apparently my blitzer does not fit a full pint of liquid and makes a huge mess all over the kitchen when I ask it to try just this once. Also the blades aren't sharp enough to mash the almonds fine enough. So I did about half way in the blitzer then transferred small batches to work in the mortar. Strain the milk through a fine sieve or cheesecloth. Flavour with more honey and spices if needed, and sprinkle a few spices on top. I loved how this tasted! I cannot tell you how different this Caudle of Almonds was to boxed almond milk without falling into a huge pit of cliches - It's not even the same planet, worlds apart! And I don't think it's just that this was made with wine, wine is lovely and all, but it was the pure almond-ness quality, the almond milk qua almond, that made is delightful. Vegan friendly? - you need to substitute the honey with your favourite sweetener for this to be vegan friendly. It's easy enough to do, so I am going to give it a qualified yes. Affordable? - um... depends. If you are like me and do not trust the bulk food bin and have to special order almonds from a place that doesn't mix nuts, no it is not even a little bit affordable. But as far as normal people go, it's probably okay on price. Allergy issues - depending on your allergy it can be a friendly or feendish drink. See my affordable section above about mixed nut contamination which a lot of people who don't have nut allergies in the family aren't use to taking into account, and not suitable for people with allergies to almonds. Some people may have reactions to the sulphates (assuming you are using a commercial wine) in the wine. However, it makes a great substitute for milk and is excellent substitute for warm-milk-before-bed drinks like horlicks. Garlic pasta is basically noodles, garlic lightly fried in butter and cheese. The salad is cucumbers and tomatoes from the garde, with a few balls of mini motza (bocconcini? ), sprinkle of salt and a generous helping of olive oil. I think that I would like to start posting (and therefore taking photos of) my Friday pasta meals. I think it would inspire me to make more beautiful food and explore a greater variety of pasta sauces. Here is where I dress myself in full pirate regalia, eyepatch included, for it was said that one shall not discuss the details of the religion of the Flying Spaghetti Monster unless one is dressed in the Holy Garb. Pastafarian literature tells us that there is a heaven, and in heaven there is a beer volcano. An unlimited supply of beer is all well and good, but an actual volcano? Call me...um... call me someone who doesn't follow the dogma of a religion to it's extreme, but I don't imagine how a volcano that spews unlimited amounts of liquid brew into the eternal resting place of my soul, would be a good thing. I know, I know, heaven isn't suppose to be logical, but wouldn't an unending flow of beer eventually fill up heaven? I mean, how can we drink enough to prevent the constant deluge from becoming a flood, when we are dead? The Whole Wheat approach to the subject of beer is a bit different. We love the idea of drinking beer on Fridays, the holy day of those who follow the teachings of the Flying Spaghetti Monster. Beer goes great with pasta and many other things. But maybe, the volcano of beer is a metaphor for how to live our lives better in this world. The Whole Wheat Pastafarian looks at beer much the way we look at food, only with more importance. The Flying Spaghetti Monster created the world in which we live in, and being a deity that resembles food (or that we have a food that resembles the divine), the Whole Wheat Pastafarian believes that this is a sign from his divine noodliness that it is our duty in life to create the best foodstuff that we possibly can. Be this cooking at home, or growing the best ingredients, whatever our path in life, the Whole Wheat Pastafarian holds sacred the creation of food, not just for today, but we also believe that it is our duty to keep the world as healthy as possible so that future generations can also enjoy the same, or better, dietary connection to the divine that we feel every day. Some may say that it's not much different than the bread and wine that Christian followers believe. In fact I've seen some of the more evangelical members of the Church of the Flying Spaghetti Monster may go much further than that, but they are, um, more extreme in their religious view. The Whole Wheat Pastafarian would never go that far, as moderation is the key to keeping a healthy diet, healthy soil and healthy relationships with others. To create healthy food, we need to create a healthy food source. Good tasting food that nourishes the body and spirit, comes from healthy farming practices. It is more complicated than I'm going to go into here, but basically it comes down to healthy soil. Healthy soil means that we grow delicious food for ourselves and can continue to produce food to feed the world for generations to come. The second most holy task the Whole Wheat Pastafarian can set themselves in this world is to grow food (especially grains that make yummy pasta) in a way that improves the soil over time so that whomever comes next, can have a better starting place than their predecessor. This stands in stark contrast to those who have lost their ways, and the vast wastelands that now exist where before, was fertile soil only a generation ago. Whole Wheat Pastafarians are very quiet on the internet, most of them are too busy growing food or cooking it to spend time chatting in the virtual world. However, I suspect that those who feel the touch of His Noodly Appendage most strongly in this world, pursue the art of brewing beer. Perhaps, and I speculate here, this is where the symbol of the Beer Volcano comes in - a powerful brimming over of potential and spiritual intoxication. I know I feel a compulsion to brew my own beer... but not only that, to grow my own barley, to malt it at home, to select the hops or other herbs to bitter the brew, to capture the miracle of wild yeast that lives invisibility in the air around us, to... to recapture that once true spiritual calling that accompanied brewing. Be it the monasteries of the middle ages, the Bacchanalian cults of the ancient Greeks, be it the touch of His Noodly Appendage into my soul... I want to make beer, from scratch soil. So I bought a tin. That's probably where I went wrong. Short cuts. But I'm not yet ready to invest in a from-soil method of brewing. The timing just isn't right. I followed the instructions on the back of the tin. I got something that smells like beer but tastes like old socks. It's good enough to cook with, but not much else. Maybe homebrew beer from a tin is not for me. Maybe I should just stick to cooking and brewing apple cider... or maybe an opportunity will present itself in the future, encouraging me to try again. Maybe I'll call it divine intervention, or perhaps I'll call it a happy circumstance. I've been fermenting a lot this year. Be it making apple cider or sour cucumber pickles, I find the magical transformation of fermentation deliciously fascinating. Fermentation covers a wide variety of foods, including apple cider, cucumber pickles, sauerkraut, kimchi, and more. Some of which I've featured on this blog, some of which I still need to write about. This is the book that gave me the confidence to try (and stick with till the end) home fermenting experiments. Sure I've tried my hand at fermenting before, but usually chickened out when mold formed on the surface, or when the experiment gave me stomach cramps and the runs. The problem was, I didn't really understand what was going on when things ferment. But Katz book helped solve that. Wild Fermentation is a collection of recipes, stories, and information on what's going inside your vat, and how to get the best result. I've tried many of these recipes, and plan to try more in the near future. Not all of them turned out well, but the ones that did, are now things I make on a regular basis. I do find that many of the pickle recipes turn out too salty, so I tend to cut the salt in half if I just want a quick'ish pickle I can keep long term in the fridge. By reading Katz (both this and his other book The Art of Fermentation) I now feel confident that I can adjust the salt for what I want to achieve and the time of year. This is a beginner friendly book, but is useful for fermentos (apparently that's what they call fermentation fanatics these days) of all skill levels. A collection of recipes from rural France, it has the feel of someone going around a bunch of villages and talking with the old ladies, asking them what recipes they use to use before refrigeration. This, in my opinion, is Fantastic. I love how the author collected and preserved this knowledge which would otherwise have been lost. I also think it is a great opportunity to learn how to extend the shelf life of foodstuff using little or no electricity. The recipes, however, are not for the faint of heart or inexperienced. Think of them more as guidelines: you take some of this, do some of that till it has this subjective quality, then do some vague thing. This is really good now that I have a bit of experience with fermentation, but I would not recommend this as a beginners book. The chapter on fermentation is small, but has some good recipes in it. The book also covers preserving in oil, vinegar, salt, sugar, alcohol and drying. I recommend this book to people just for the chapter on cholesterol and fats... it's the best explanation I've come up with about what it is, what it does, how eating foods that contain cholesterol affect our health. Why it may not be such a bad thing after all. All that said, I do not recommend Nourishing Traditions for the recipes. I've tried about a dozen or so by now, and the best case scenario was foul tasting mush that even the chickens turned their beak up at. There are a few bouts of suspected food poisoning from trying some of the fermented recipes... but I don't know why. Is it just that the microbe community in my gut cannot handle these traditional foods? Possible but doubtful. The methods in the recipes look like they should work, and I know enough about fermenting now to adapt for environment and so forth. It may just be one of those things that just doesn't work for me - like certain sewing machines I've known, they work for everyone else, but when I sit down at them there are tangles of thread, broken fabric, and wisps of smoke. Sometimes no matter how much I want it to be, there are some items in this world I am simply not comparable with. I suspect the recipes in this book are one of them. I would recommend this book for the more curious reader. Someone who has their toe (or entire leg) in the door and wants to learn more about the whys and wherefore of human diet. It's not for everyone as things get technical really quickly. Michael Pollan touches on many of these issues in his book In Defence of Foods, so for the more casual reader I suggest you start there. This thick tome is more an in depth exploration of fermenting then a recipe book. This is where you go when you've made a first batch of Sauerkraut or two and you want to know more. What else is fermented in this world, how can I make my kraut better... &c.
After an embarrassingly large numbers of failures to make ginger beer, including following the recipes in Fallon's book and Katz other book, Wild Fermentation, I gave up. That is until I read the section in The Art of Fermentation, which casually described the process of making ginger (and other root beers) in a vague, non specific way. Yes, I know non-specific if redundant there, but think of it as rhetoric, because it was such an ambiguous explanation. It was also exactly what I needed. Forgetting recipes and following a small selection of words otherwise burred in a large book, I was able to make ginger beer, successfully, that tasted quite good. The ginger beer improves each time I make it. It got me thinking maybe fermenting doesn't need a recipe, maybe it works better if it is allowed to develop ...dare I say it?... organically. Maybe that's what Katz message is all about, recipes are there to help you get the hang of how things ferment, but once you understand what's going on, you don't need to stay bound to a set series of instructions. Working with the knowledge you gain from reading and experimenting, you can try different and creative things. Afterall, isn't that what fermentation was like before the industrial revolution? People had too many crops - trust me, when a crop is ready, it is Ready! - and they used fermenting as a means for preserving the foodstuff for the winter months. This is a book for anyone not an absolute beginner. It ranges from moderate-beginner to extra advanced, been doing this all your life, kind of information. Like Pollan's other books, this is a fantastic introduction on how we cook. It's a collection of storytelling and explanation on everything cooked from roasting meat over an open flame, to making a stew, and yes, even a quarter of the book dedicated to fermentation. Cheese, bread, wine, beer, mead, pickled swiss chard roots, are just a few of the fermented foods he explores. There you have it. These books make up the fermentation section of my library. I will likely add some more books and update the links later. But for now, I have some ginger beer to brew. Every year for the local Fall Fair I spend a day demonstrating fibre arts. It's a whole day surrounded by excited people, barns full of animals, colourful exhibits, the sound of fair rides, and the smells of food stalls. It always starts with the smell of frying onions, about 10 o'clock in the morning. The international food stands arrive first, as most of their cooking is from scratch on site, with a few dishes made the night before at home. Next is the smell of things frying in oil, I know the more 'traditional' - or should I say more modern - cooking has arrived. Frozen food heated in deep oil, or sometimes fresh food heated in deep oil like my favourite smell, the doughnut stand. He has a gooey mess of fresh batter and this antiquated machine that transforms gooey mess into fried mini doughnuts, for sale by the half dozen. Sprinkled with cinnamon and sugar. Then the smell of spices compete with the smell of charred meats on the BBQ. A deep breath and I can just about feel the crunch of the grilled Bratwurst break open in my teeth, the juices running down my chin, the toasted bun sopping up the juices, and the sauerkraut....mmmm, sauerkraut on hotdog! All these wonderful smells are pure torture for someone with food allergies and sensitivities. There are days when I would rather have my toenails pulled out with a pair of pliers than to have to walk through a food court - especially one with good quality, freshly made food like the stalls at the Fall Fair. The only way to tolerate this torturous tantalization is to bring a lunch just as delicious as anything that can be bought at the fair. This is a three layer Bento, well actually a Tiffin container from India. Bottom layer contained rice, ume, and a cute little chicken container filled with Spicy Rooster (I don't know what it's actually called, but it has a picture of a rooster on the bottle and is exceptionally spicy) sauce. The next layer, some boiled broccoli, a cherry tomato from the garden, and chicken Kara Age. The chicken is marinaded over night, coated in cornstarch, fried in about half an inch of oil, then marinated again. It's exceptionally yummy! The top layer is fruit: Apples, grapes, and a selection of cheese. Everything except for the fruit layer, is packed hot and allowed to cool - this way the moisture can evaporate and the lunch will keep from spoiling in hot weather. Of course, the chicken always gets eaten first, as it is so delicious. Affordability? It's about $1 worth of chicken plus everything else, I would say about $2 for the entire lunch. Maybe less if you can find some of the items on sale. All in all, not too shabby.